The World’s Most Powerful Proteins, Omega Oils & Natural Growth Stimulants! 4) Plant Tonic 5) Soil Conditioner 6) Microbes Booster. 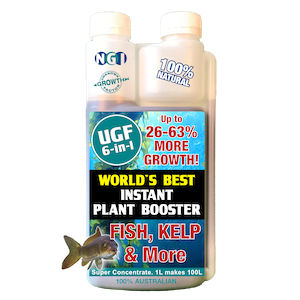 INGREDIENTS: Super Concentrate of over 50% Cool Processed, Whole, Fast Growing Fish, rich in valuable Fish Stimulates, Proteins, Omega 3 and 6 Oils; Amino Acids PLUS Deepwater Kelp Multi-Vitamins and Nutrients. SCIENTIFICALLY ENHANCED with naturally occurring humic and fulvic acids, selenium PLUS 70 trace elements and crucial ingredients. There is nothing else like this, as advanced, natural and powerful! 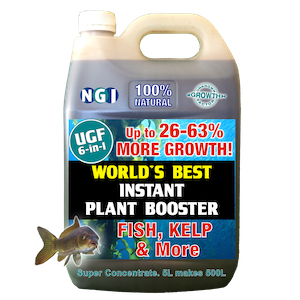 INGREDIENTS: Super Concentrate of over 50% Cool Processed, Whole, Fast Growing Fish, rich in valuable Fish Stimulates, Proteins, Omega 3 and 6 Oils; Amino Acids PLUS Deepwater Kelp Vitamins and Nutrients. 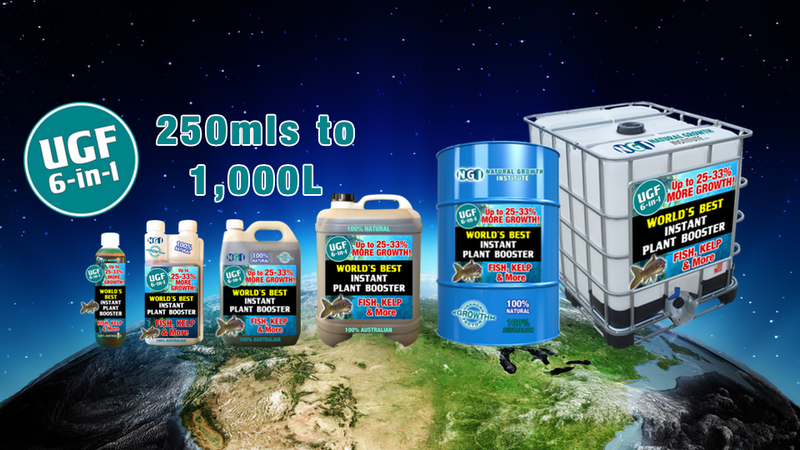 Faster, Healthier Plant Growth, Greater Resilience, Lower Costs, Less Maintenance, Richer/Livelier Soil and up to 33% Less Water. 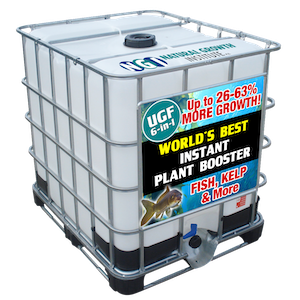 – Up to 26-63% More Prolific Growth! 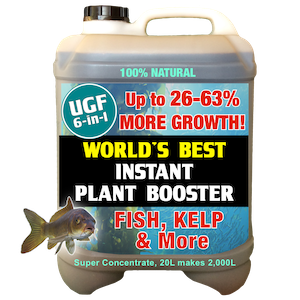 – Fast acting in roots then stems, foliage, buds, flowers and fruit. – Larger, fuller, more vibrant flowers and fruit. Relied on by Champion Exhibitors! 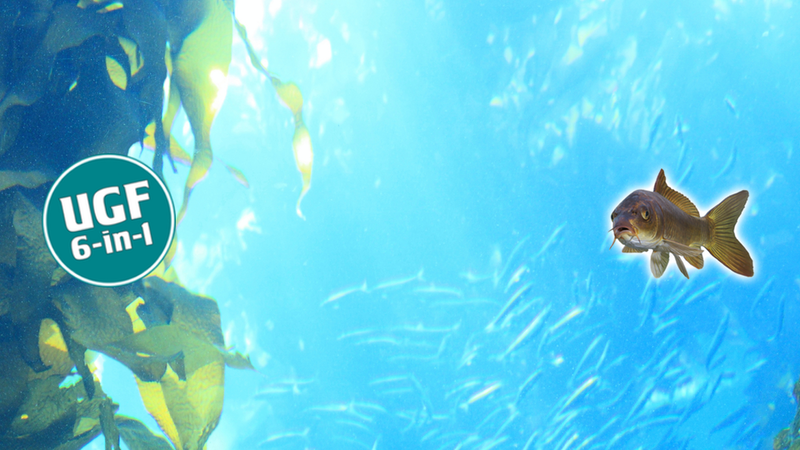 Have you ever heard of the ‘UNKNOWN GROWTH FACTOR’? No?… well, most other people haven’t either. 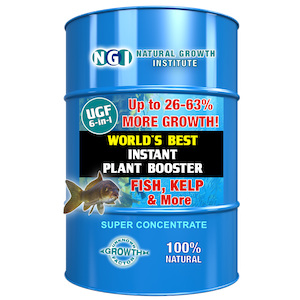 Put simply, the Unknown Growth Factor (UGF) is a term coined by Scientists to describe the phenomenal growth rate of Dolphin Fish (Mahi Mahi). 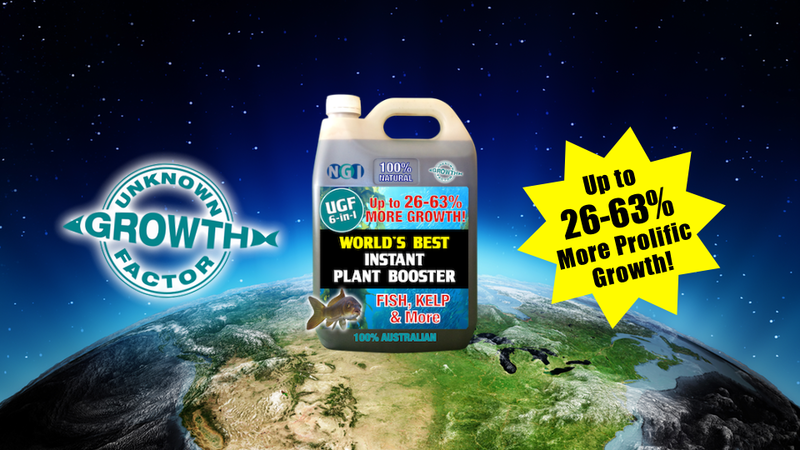 After 25 years of development, the essence of this ‘Unknown Growth Factor’ has been harnessed and kept in a heightened liquid form for fertiliser and a powerful multiplying boost!